Life gets in the way of crafting. Well at least it seems that way when I want to explore a new area of fiber arts. For a while now I have had my eye on needle lace. Ever since I made those little sepals for the raspberries in my stumpwork embroidery. To actually make lace fabric with a needle and thread just seems like fun. I bought this book from YesAsia because the little picture looked like it could be needlelace. It is and more since it has several cut-work designs too. The foundation stitches in the book are worked in traditional button-hole stitches, but I think the crocheted cord used in Romanian point lace would do nicely too. There are a lot of different styles of needlelace. Again I am drawn to the ones that use ribbons to divide the stitches. I also like Schwalm embroidery, though totally unrelated, it has the same feel of outlined texture to me. As for life interfering, computer issues are still requiring me to find photos to write about that are already on flickr. This entry was posted on Monday, November 17th, 2008 at 3:00 am and is filed under Lace. Tagged: Book, Needlelace, Thread. You can feed this entry. You can leave a response, or trackback from your own site. 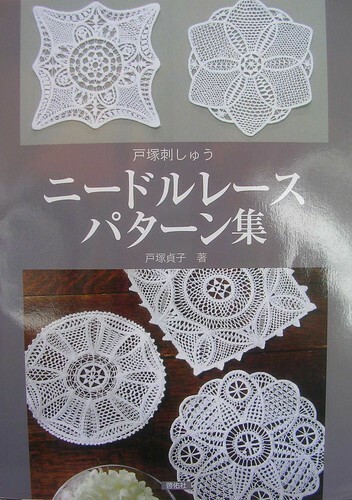 I am also very interested in making needle lace, etc. Where did you find this book? Also, have you ever done ayrshire embroidery? If so, do you know of a book that teaches you how to do this type of embroidery? Thank you and have happy stitching.